I was strolling along Marine Dr. in North Vancouver en route to Ambleside to have dinner there when completely contrary to my expectations, it started to rain! I had made it most of the way to Park Royal, so I decided to grab a Pinkberry frozen yogurt cup from the Park Royal village and head back to downtown Vancouver so that I could periodically insert myself into a random building to allow myself to dry. I have no idea how a small frozen yogurt cup could end up costing me over $6, but I guess those are the kind of things that happen when I forget to bring my glasses and try to guess what's on the menu. Thank goodness the bus has its own lane when queuing for the Lions Gate Bridge. I managed to arrive at Ebisu in time to catch the Happy Hour specials, which meant significant savings on fresh oysters and wings, and slight savings on an assortment of other items. I wasn't too sure about the idea of eating 10 wings by myself (the minimum order), so I settled for the oysters. 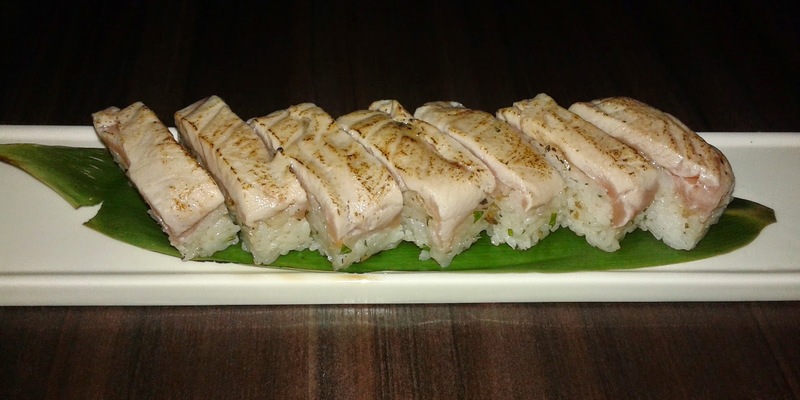 Of course, I tried some of the higher-ticket items from the regular dinner menu as well. The Royal Miyagi featured fresh raw oysters from Cortes Island, BC. As advertised, it did have a very smooth texture (it was nice and slippery too) and was free of that green part (the liver) that some may like or dislike. The oysters were certainly on the smaller side but were dressed with a lively, tangy sauce to provide adequate flavouring. 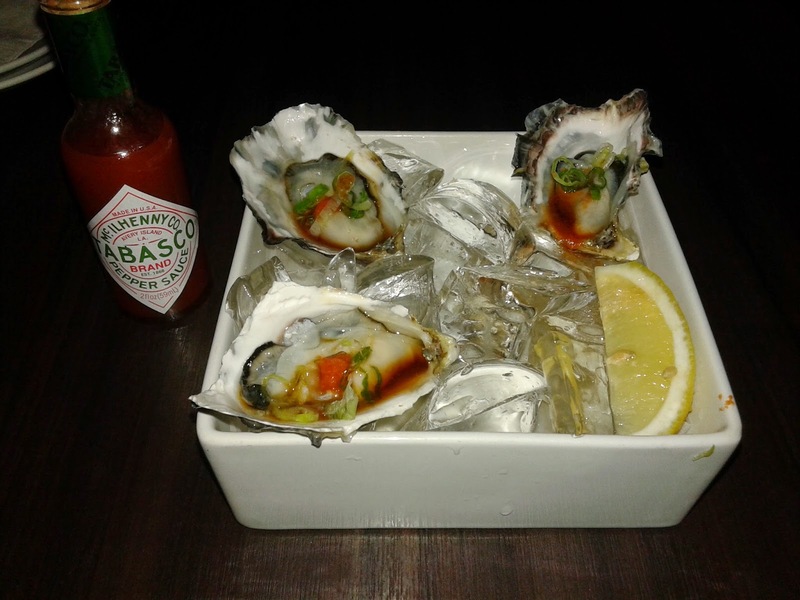 The oysters also came with tabasco sauce, but it was so spicy that when I put one drop of it on my chopsticks to try it out, let's just say that ... things happened. 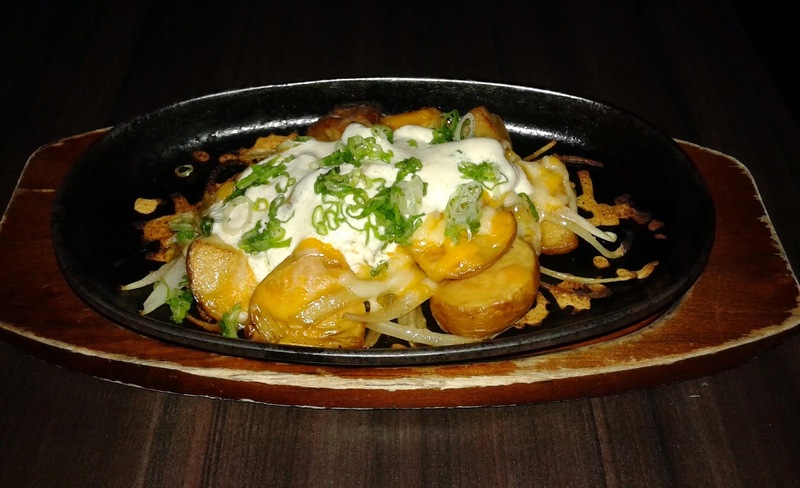 The Japanese Poutine came on an iron plate with baked Yukon Golden Nugget potatoes with smoked bacon, oozing cheddar cheese and Mentaiko sour cream on top. The baked potatoes were cut to the shape of sliced meatballs (this is possible because of the small size of the potato). I liked how the sour cream was mild so that you would notice it without it being obtrusive. The sauce on top retained a predominantly cheesy flavour and texture, though I found the dish to be rather dry as a whole. The potatoes also needed a richer taste, or more dressing. Interestingly, there is a slice of whole-grain bread stuck to the iron plate (I couldn't even ply it off) and the potatoes absorbed some of the flavour from it. After the Happy Hour specials expired (at 6 p.m.), I ordered the Toro Inferno and the Tiger Mayo from the regular menu. The Toro Inferno is listed on the menu as being the first original version created in Vancouver, and is freshly box-pressed with shiso, burdock, shiitake, sesame and sushi rice. Once it was brought to my table, a server brought a torch to sear the whole thing at my table! Each piece was seared for about three seconds, and this allowed for a smoky taste on the top along with a delicious, creamy layer of naturally-flavoured toro at the bottom. The sushi rice was soft, well-formed, and seasoned to better match the toro on top. The Tiger Mayo consisted of 5 deep-fried Black Tiger prawns accompanied by a sweet chili mayonnaise dip. 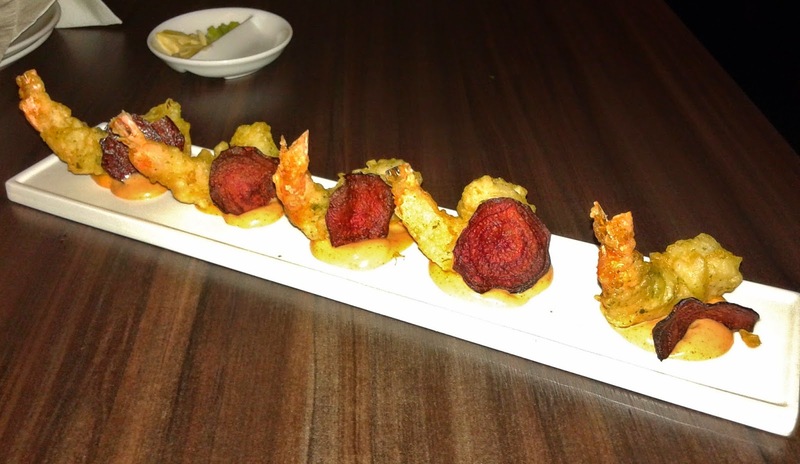 When the dish came, each of the prawns were paired with red yam chips, which were like potato chips with a slight spicy and raisin-like taste. Each of the 5 prawns were large, meaty and juicy and paired with a tasty, mildly spicy, smooth dipping sauce. The batter was light and crispy and garnished with herbs, hence the green tint. The service was quite attentive and friendly once Happy Hour ended, and the food from the regular dinner menu was of a higher caliber. The restaurant has a rather boisterous atmosphere and appears to cater to those in their 20's. However, the price range is a little steep for people of that age, and I found myself spending over $40 (including tips) without really getting full. Maybe ordering a filler (a ramen or rice bowl) next time would help.